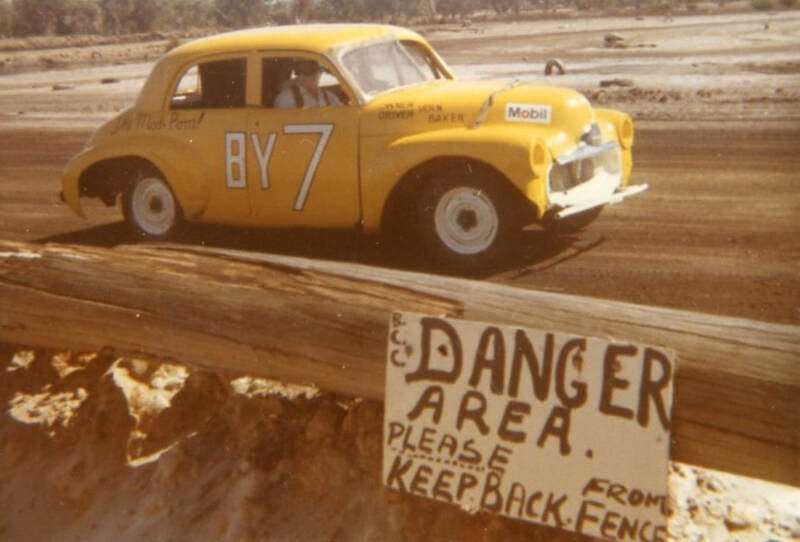 In 1965 the Bunbury Car Club had to leave there Mud Scramble circuit known as Paddy's Blunders as mineral sands mining had commenced in the inner harbour area, with the assistance of many local earthmoving company's. 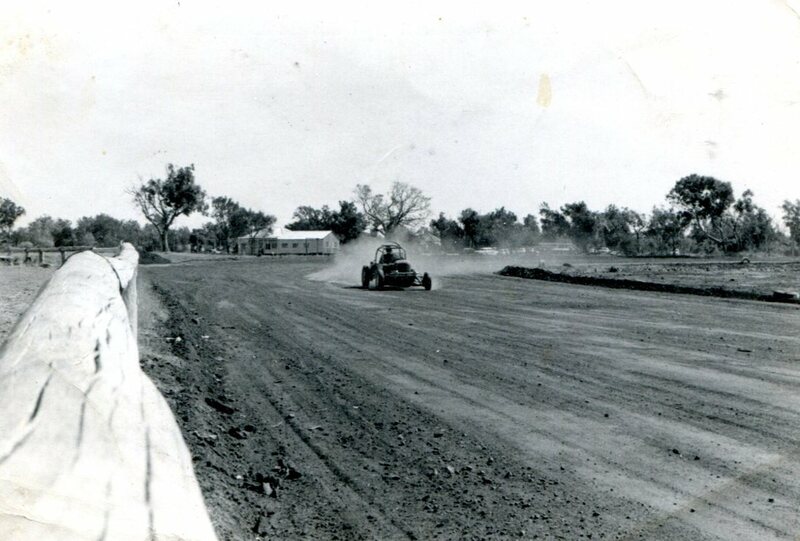 Blicks raceway was built behind the Blicks Caravan Park at Eaton with a back up track at a gravel pit just off Hurst Road near Boyanup. 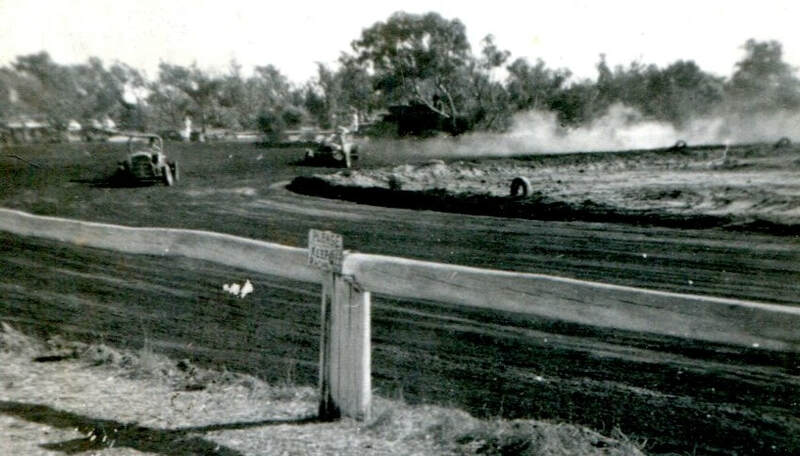 This split level circuit was built with earthmoving machinery loaned from Piacentini's who were working in the area at the time, The reason for the Boyanup circuit was because Blicks Raceway was built on the edge of the Collie River and the area was prone to flooding during high tides. 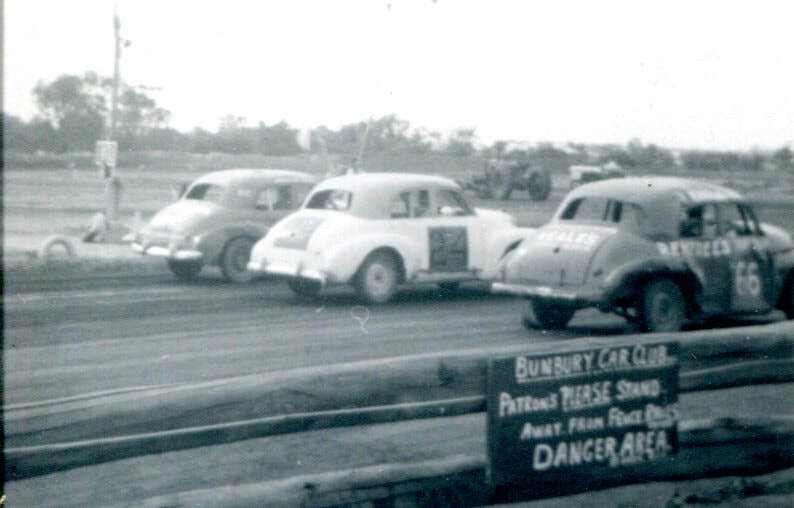 This track was the Bunbury Car Clubs first purpose built hard surface race track. 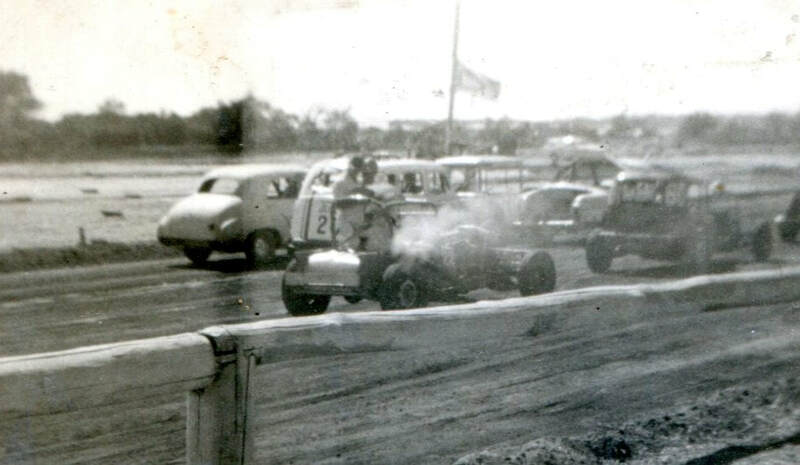 With hard track racing came many new innovations, ladies and mechanics races, the butchers picnic the last race of the day with all sedans and super modified's competing for the days honours. 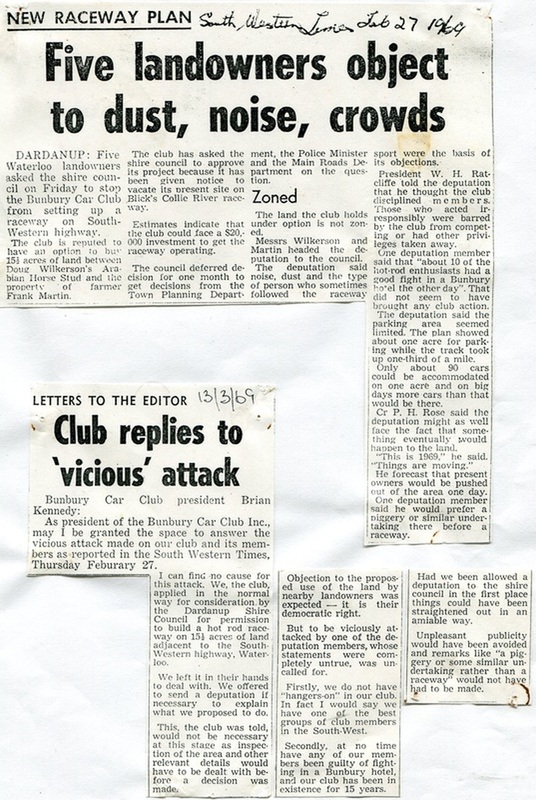 An association was formed at this time with the Bunbury Motorcycle Club whose members competed on a regular basis in particular on sidecars. 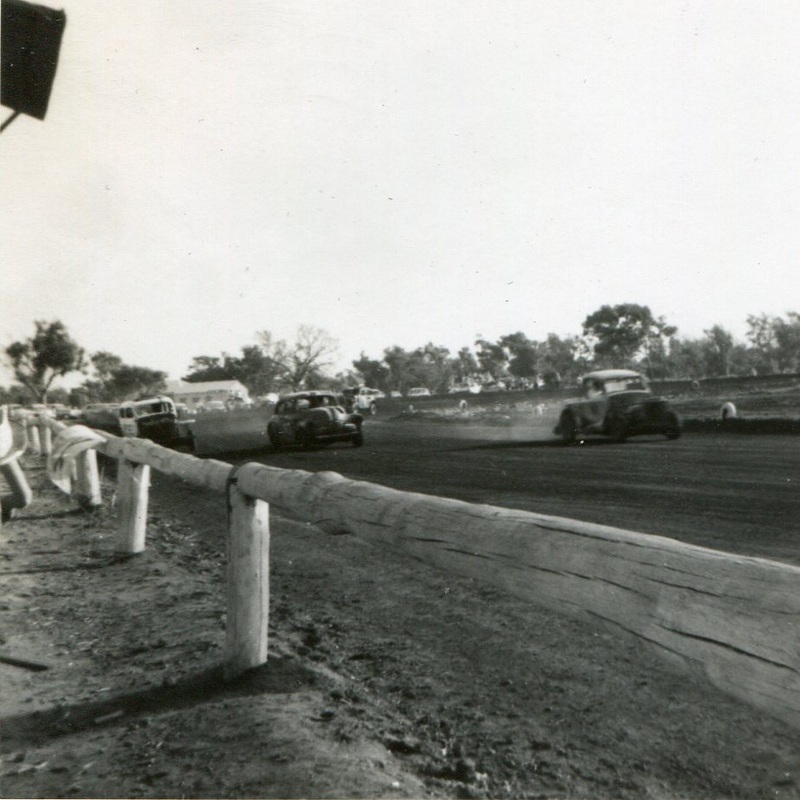 The track was built by volunteers and with the assistance of local business houses, the track was situated at Pelican Point Eaton on the edge of the Collie river, racing was held on Sundays on low tides, in the event of higher than normal tide's the meeting shifted to Boyanup. 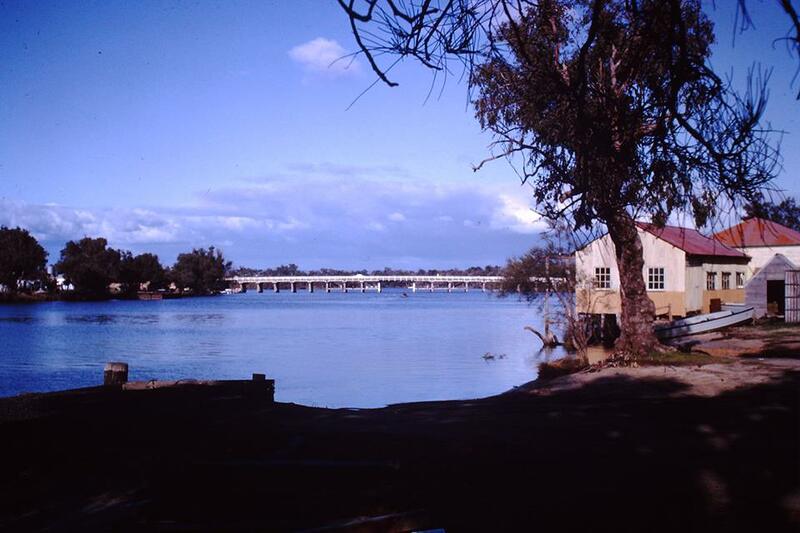 The race track and spectator area was built next to the Blicks Caravan Park and as can be seen in many photos over the river was the Shoalhaven Boat Shed and caravan park. 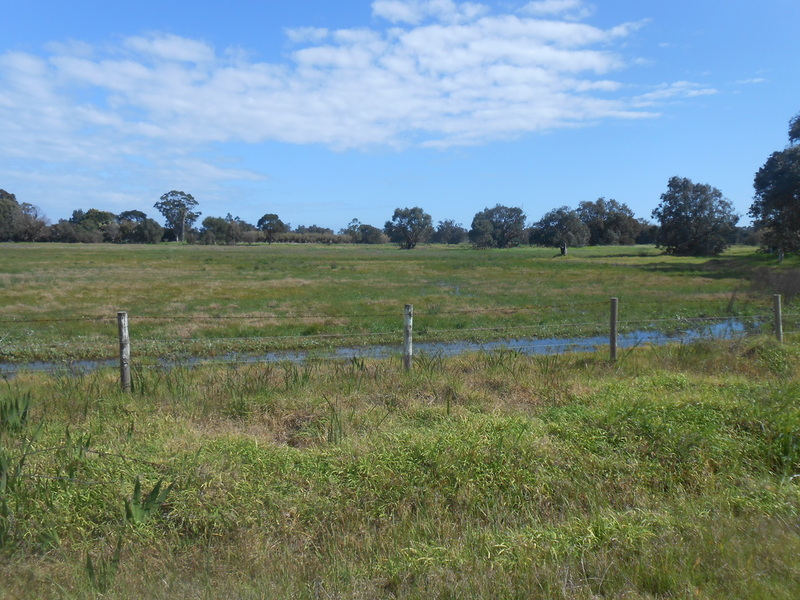 With the lease due to expire in 1970 and not to be renewed the search was on for a new home for the Bunbury Car Club, Potential sites included a part of the Hay Park Sporting comlex,Farmland off Treendale Road Australind, South West Highway Waterloo and also ﻿the current site on the North Boyanup Road. 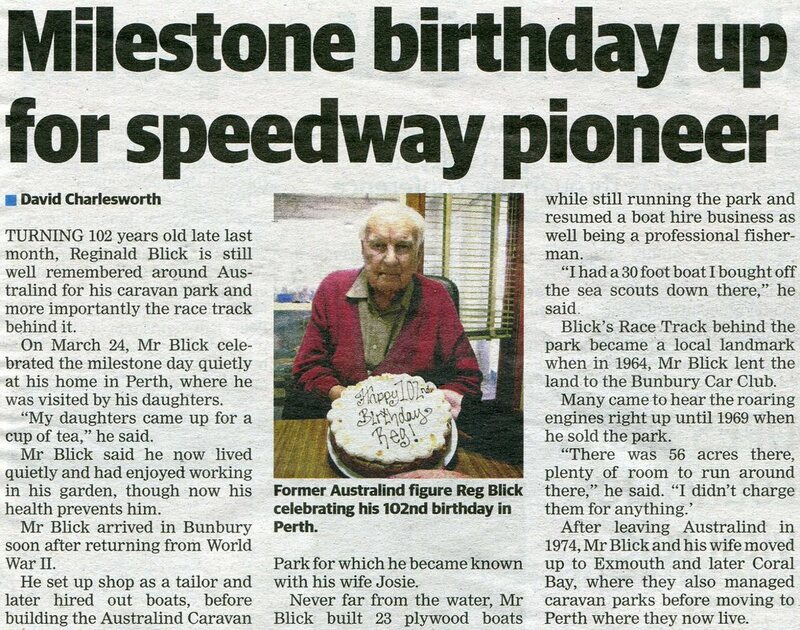 Reg Blicks recalls: In 1959 I purchased a fifty six acre block of land that was bordered by the Collie River, The Estuery and the Old Coast Road, which at the time was the main highway to Perth, Opposite my area of land was a dairy farm owned by Clarry Gibbs, That farm is now Clifton Park, Home of the Bunbury Golf Club and a housing development. At the time scheme water was not available north of the Collie River, so I had to embark on a long battle to convince the Water Board of the merits of extending there supply pipes to Australind, After trips to Perth and various meeting they decided that the idea did have merit and the only problem being the cost, well it happened and it cost me a lot of money personally. 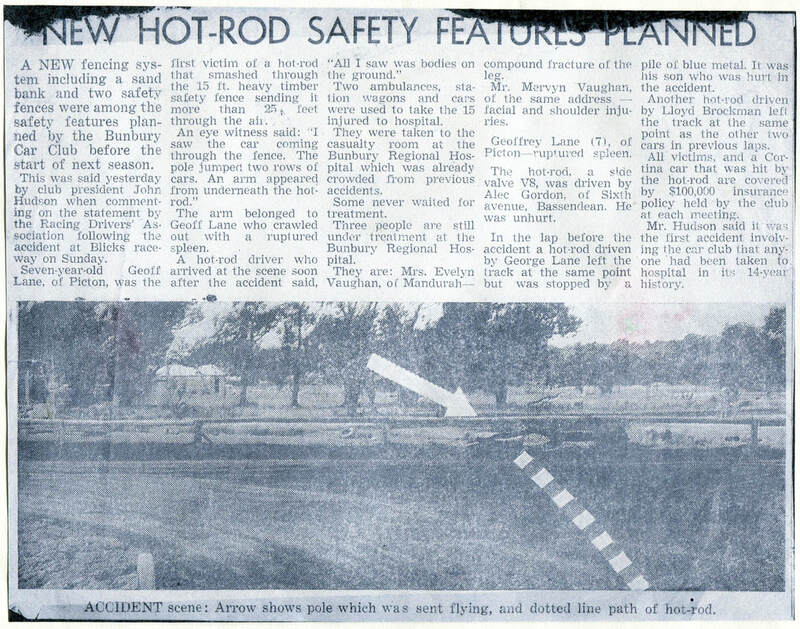 By 1961 construction on the caravan park had began, The park was a thirty bay site, the ablution blocks were built along with septic tanks, The main building was the old Bowling Clubs building from the Forrest Avenue site, When the Bowling Club decided to build there new brick and morter club house, The timber one had to go, Reg took on the job of removing the timber building and moving it to the caravan site, The building was cut into three sections and trucked buy a cartage contractor who just happened to be in Bunbury to move a house to Kalgoorlie. 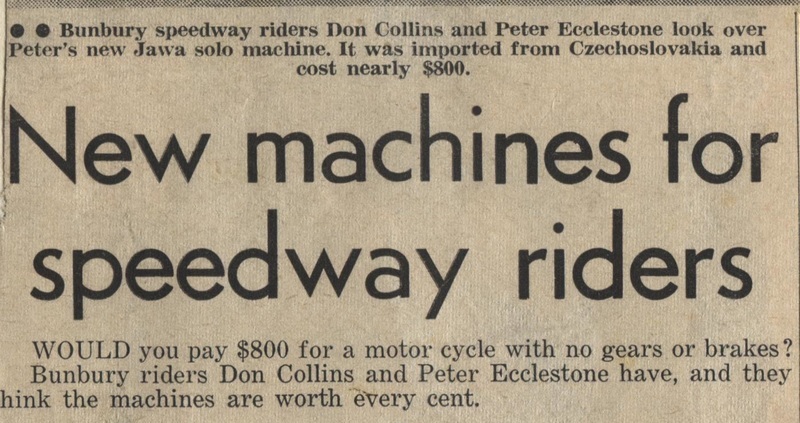 By 1969 I had sold the park to a group of developers who were going have the area rezoned as residential and sell off the lots, The new owners had no interest in having a speedway on there land so the Car Club was forced to move. 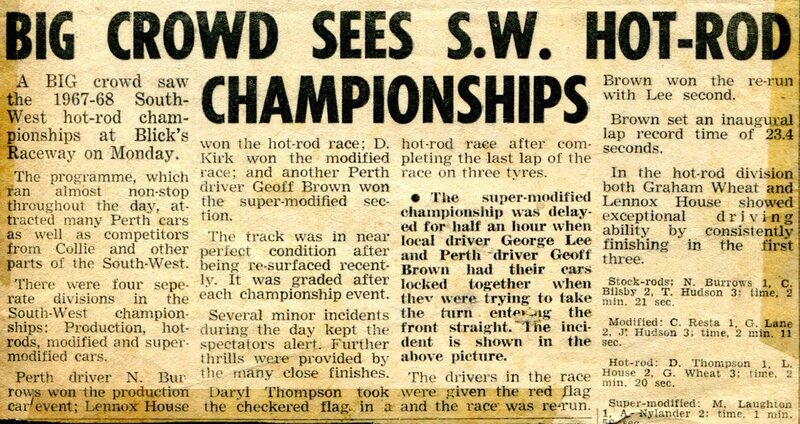 Having an interest in Speedway, or Hot Rod racing as it was then known, Ray had been a regular spectator at Claremont, Forrestfield and Wattle Grove, He had some microphone experience from the Glideaway Roller Scating Rink in Perth, where he had been an instructor and floor manager, so when the opportunity came to relieve Brian Kennedy of the commentating duties at Blicks raceway he was glad to oblige. 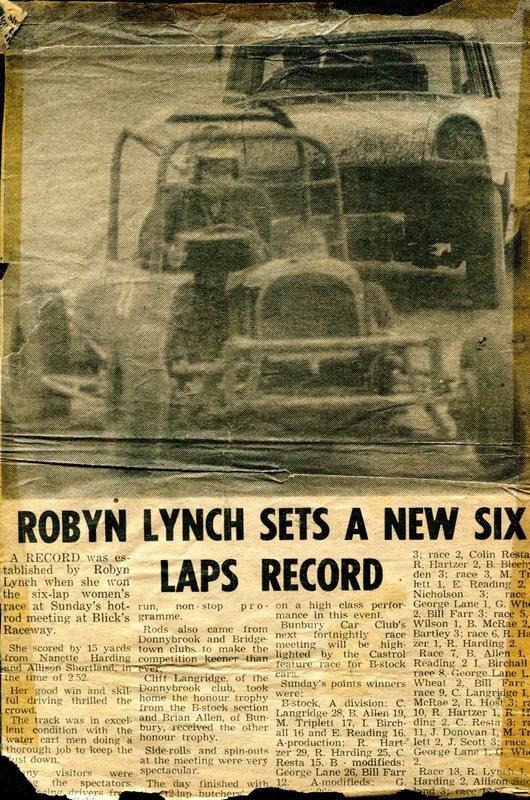 Ray became the regular commentator for the Bunbury Car Club for a period of about two years, during this time he also started a weekly radio show on 6TZ-CI about speedway, and this developed a great following and generated much interest in the sport. 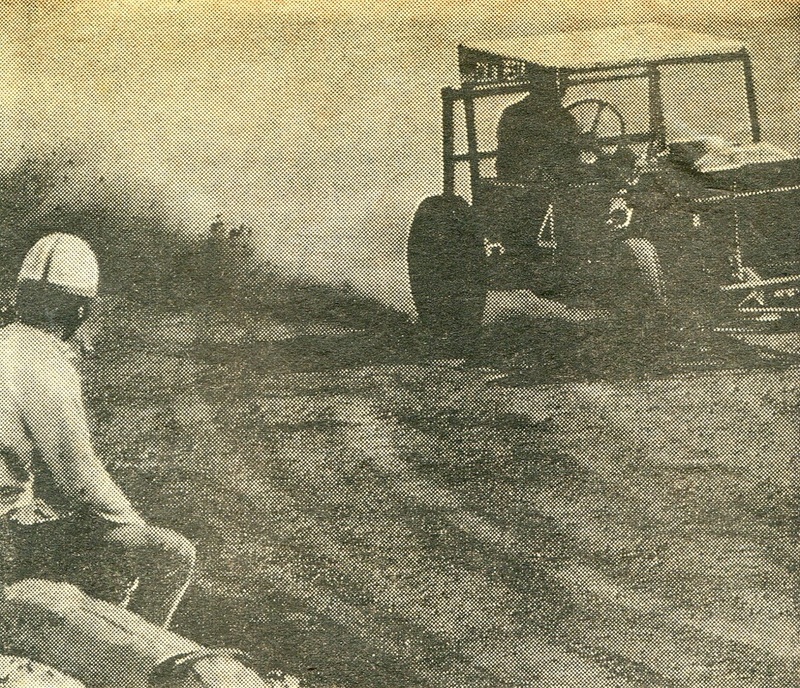 He became good friends with Norm Bain, then the breakfast announcer, and through Norms efforts, also managed to get the station manager interested in racing, this effort was not altogether successful as it was his first race, he was hit in the mouth with a rock and suffered quite a serious split lip, he did not go on air for a while. 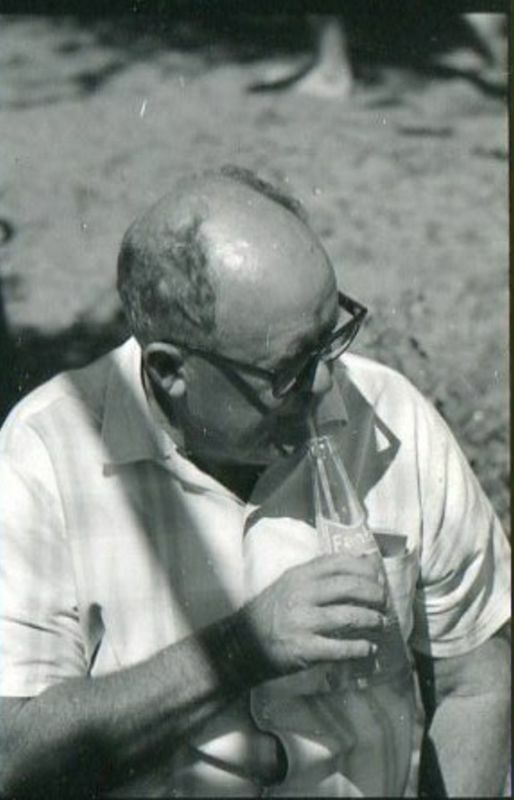 1966 - Photo's Brian Kennedy collection. Garnett Lane recalls: At the time I was racing a cut down Humber Super Snipe that I paid 15 quid for (cut down with an axe that is) I won a few races over the years and won top points for the season 3 times, part of the reason was once I had the big Humber sideways across the track the others found it a bit hard to pass. Ray Read recalls: "At the invitation of Garnet Lane, I drove Garnet's car, a Humber Super Snipe, original chassis and no or very little body, straight 6 OHV engine, it went like all stink in a straight line but at the corners it would under steer seriously, usually straight into the fence, If you tried to throw it the long wheel base took over and you just spun out, usually straight into the fence "
1966 - Brian Kennedy on a victory lap at Blicks raceway in his Ford V8 Hot Rod. 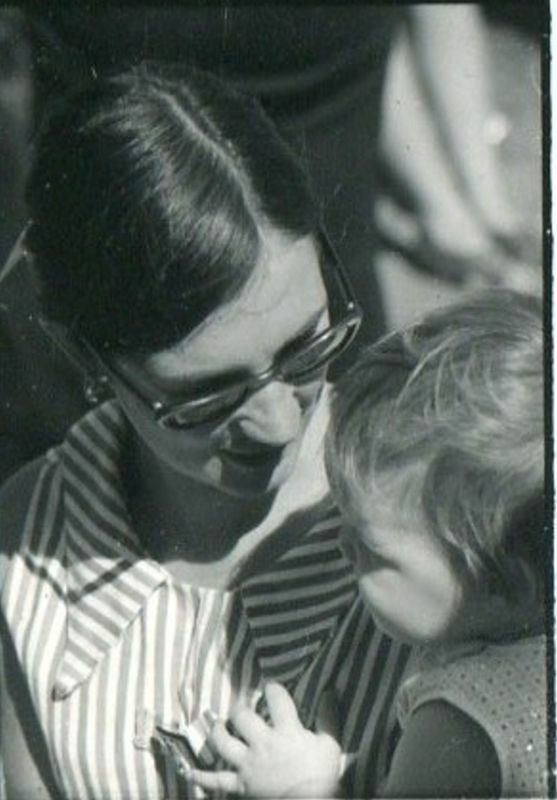 Photo: Brian Kennedy collection. Pat Kennedy recalls: when Brian did a victory lap he would stand on the seat waving and ﻿steer the car with his foot, the photo is the day he won me a gorgeous silver tray and a coffee set. 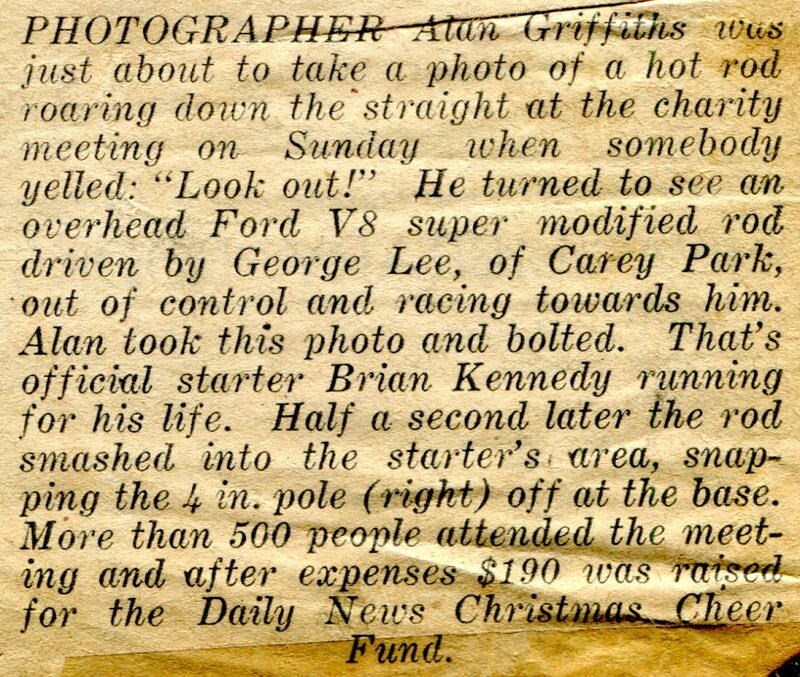 Garnett Lane recalls: I remember this accident quite well, I was racing in the super-modified race when Mr Gordon's car crashed through the safety fence and hit the four spectators, As I rounded turn four I could see what had happened and the injured people on the ground, I started to panic as I new that is were my 14 year old son Geoffrey was standing, I stopped my car next to my brothers George who was also in the race, I can remember shouting out has anyone seen Geoffrey, George told me he was under the car. 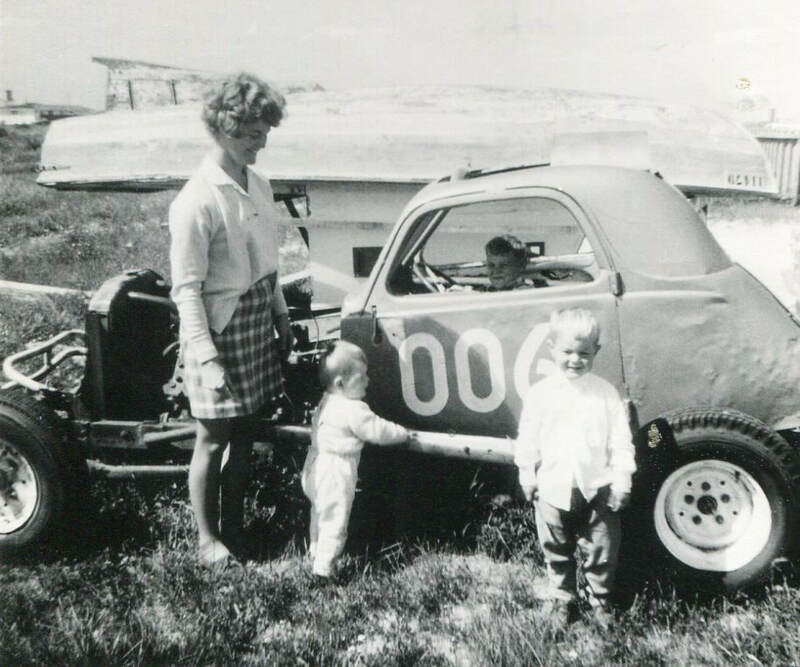 1968 - Terry's family with his Hot Rod that he raced at Blicks and around the state. Photo: Terry Lee colection. 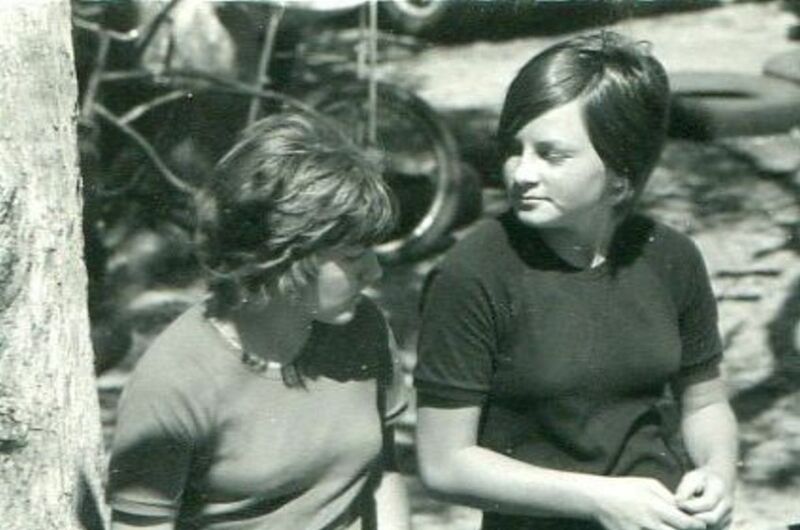 1969 - Nanette Melvin - Jan McDermott (behind) - Jan Almond and Nolleen Wheat enjoying the sun. Photo: Brian Moyle. 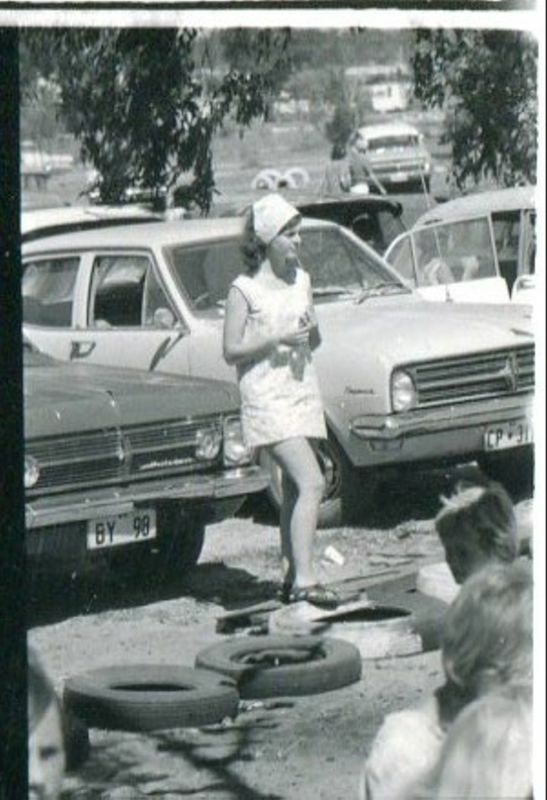 1969 - The Hot Rods on the edge of the River were an attraction for many locals on the Sunday avo. Photo: Brian Moyle. 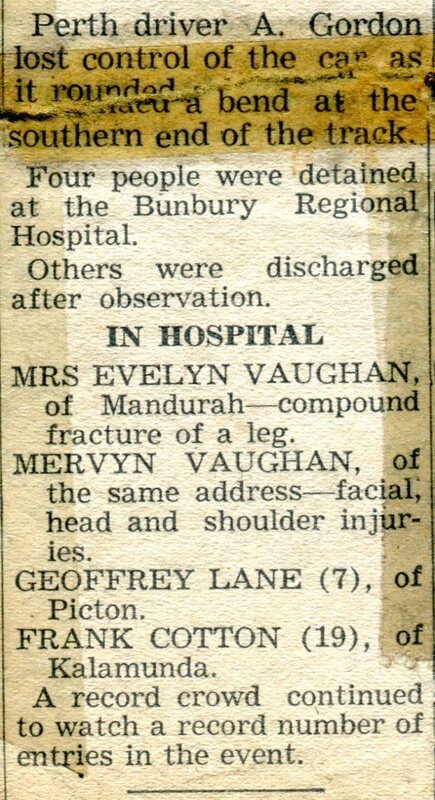 1969 - Jan McDermott from Bunbury often at Blicks. 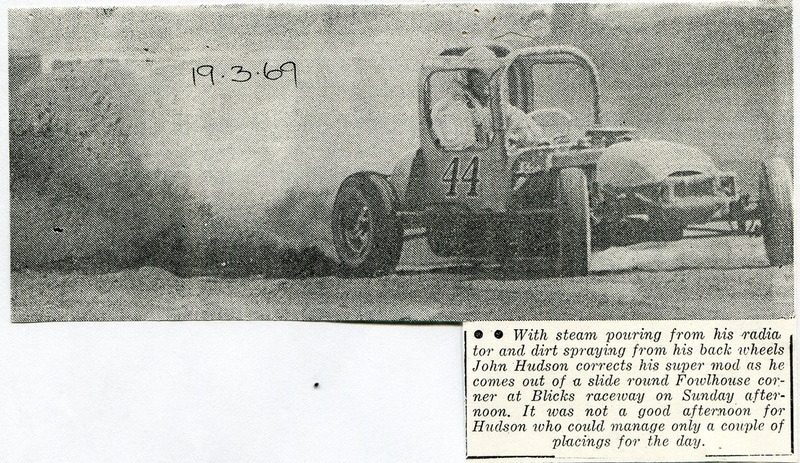 1969 - Getting into Hot Rod racing at an early age. 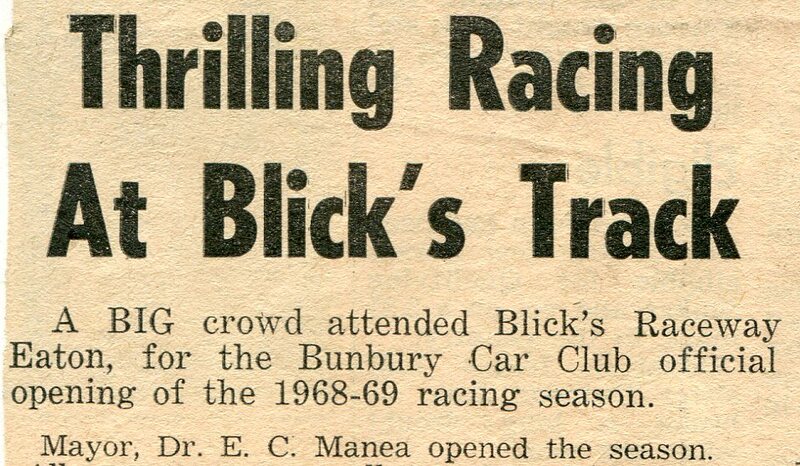 1969 - The entire family got along to Blicks Raceway. 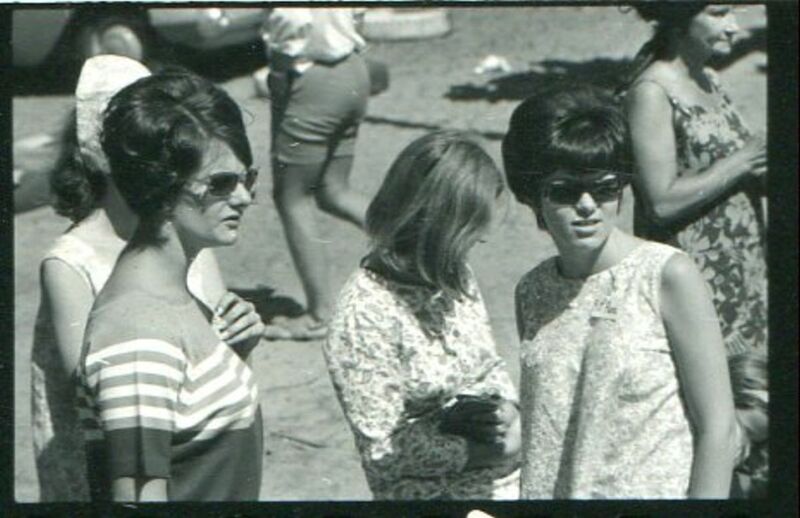 1969 - The public came along and enjoyed the hot day. 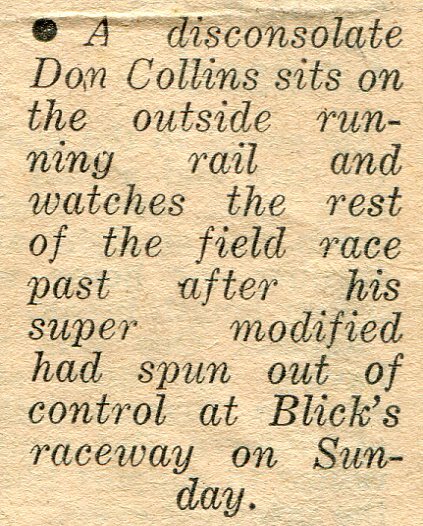 1969 - Ernie Readings 48 series Holden with the bonnet trimmed back to allow for a bigger radiator. Photo: Ivan Burke. 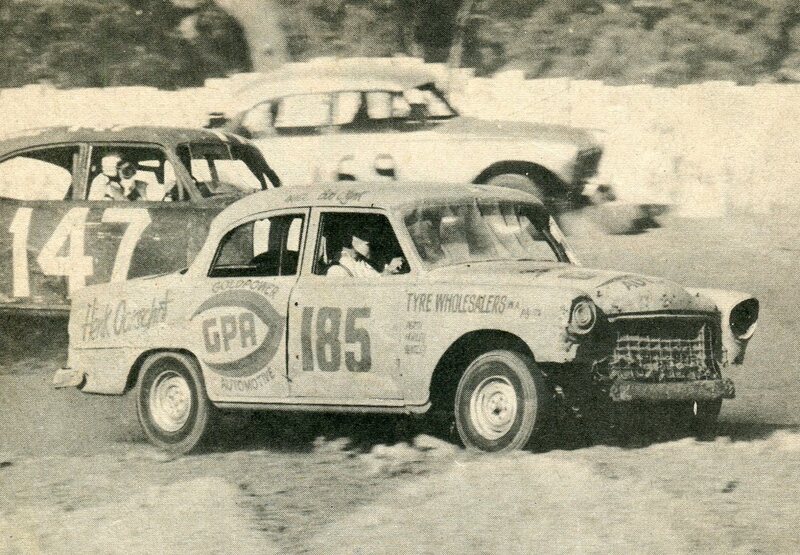 1969 - Jim Renfree 66 on the outside with Ernie Reading 24 and unknown on pole at Blicks. Photo: Ivan Burke. 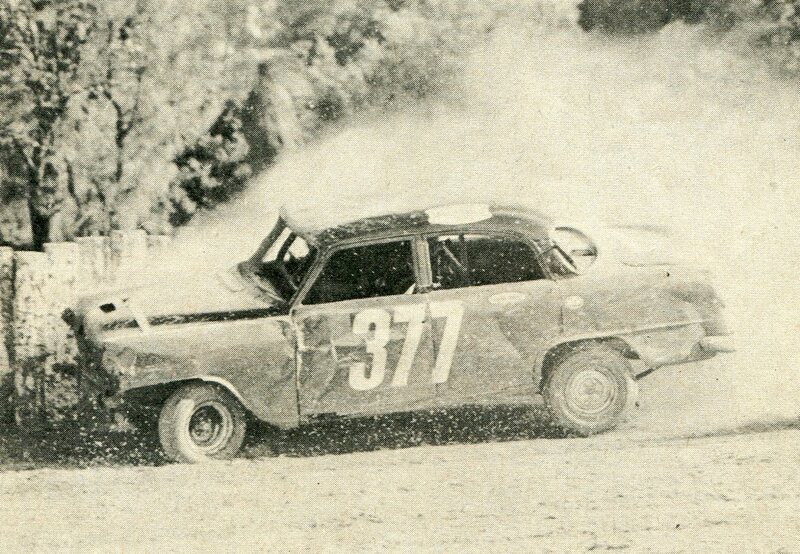 1969 - Wendy Lange rips up the surface at Blicks, these girls were not afraid of the speeds. 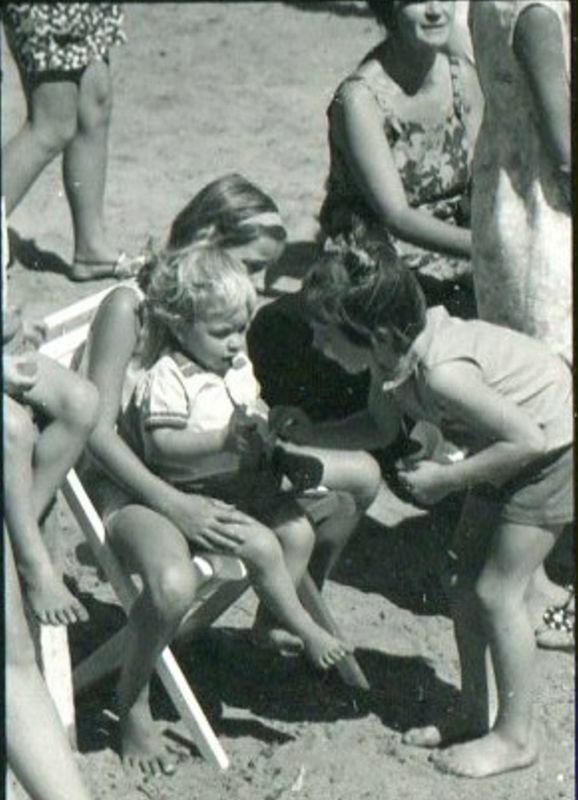 Photo: Lange family. 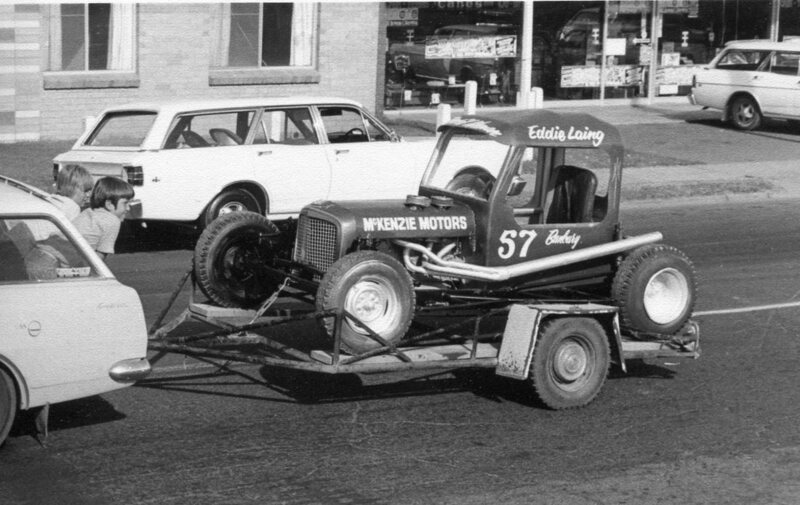 1969 - LLoyd Brockman in his Holden modified in a street parade outside the Rose Hotel. Photo: Brockman family. 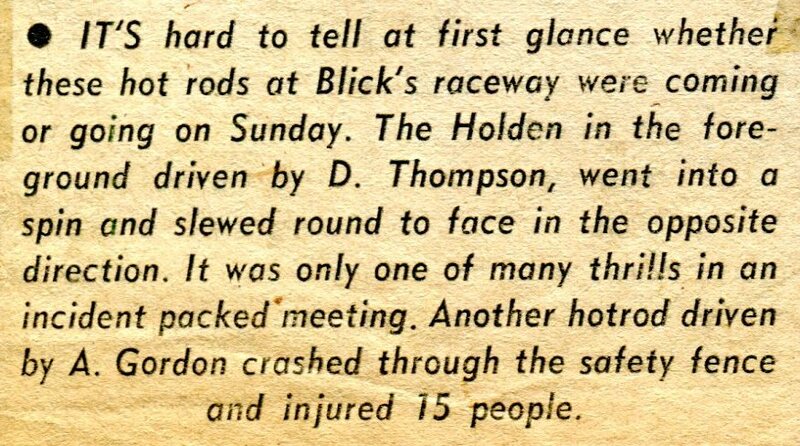 1969 - As Brocky had done many times before rolls out of the pits at Blicks to take all on. Photo: Brockman family. 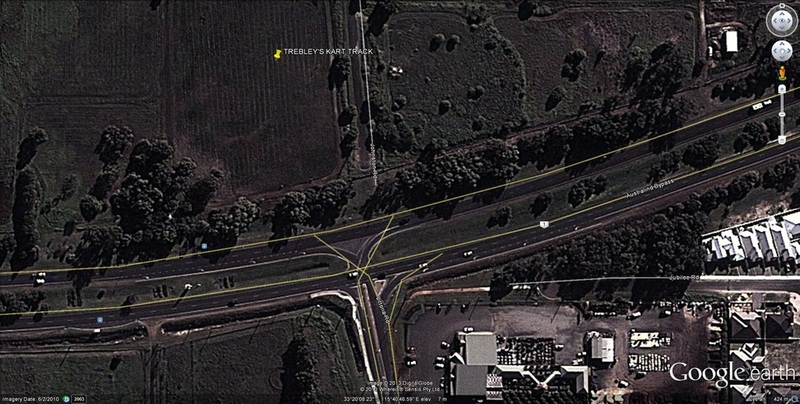 John Bartley Recalls: racing at Blicks one day while racing around the outside of Arnold Casagranda the two cars clipped sending me over the dirt embankment and coming to rest on the other side, as I was about to exit the car Brian Mcrae in the Honda scamp followed me and landed on top of me. 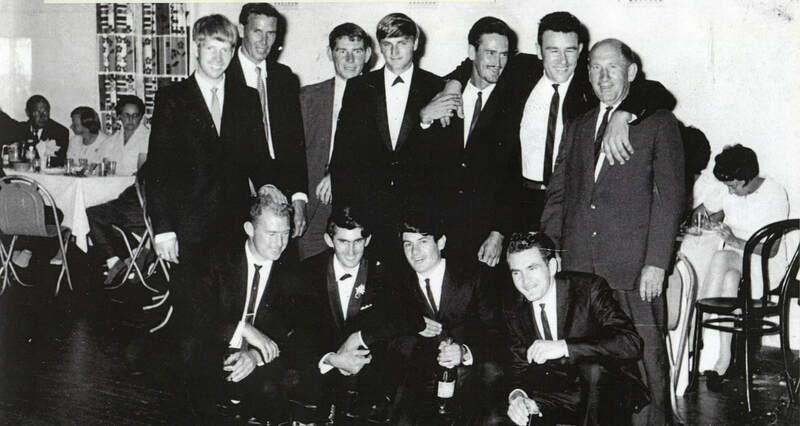 1969 - At the Bunbury Car Club presentation dinner is rear Des Lehman - George Lane - John Hudson - Mick Bayliss - Garnet Lane - Colin Resta - Dave Blythe - front Brian Kennedy - Kim Reid - Graham Wheat and Darrel Thomson. Photo: Kim Reid. 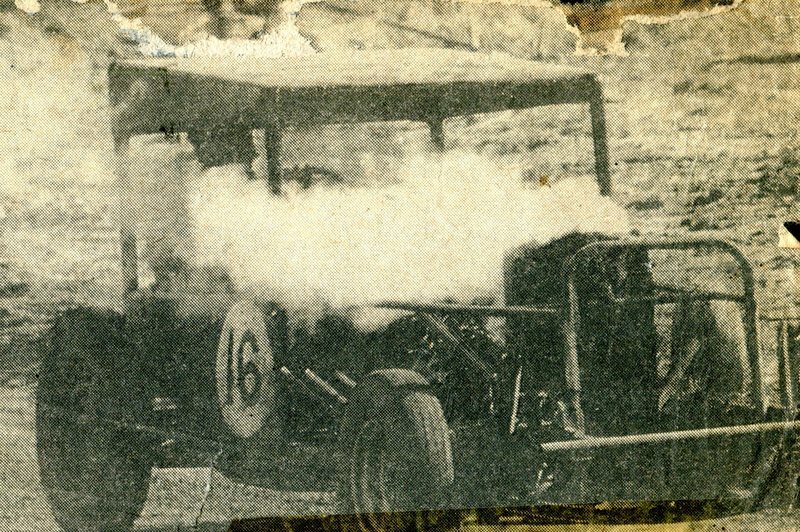 BOIL OVER - Steam pours from the radiator of the number 16 Hot Rod during the meeting at Blicks Raceway on Sunday afternoon, There were several who experienced mechanical failures during the meeting including George Lee who blew an engine. 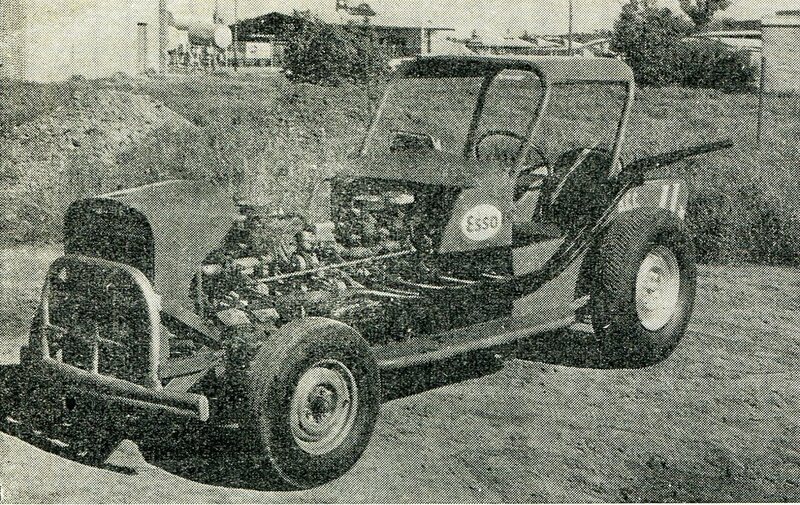 1969 - Geoff Prosser's twin engine super mod still in its drag racing trim. 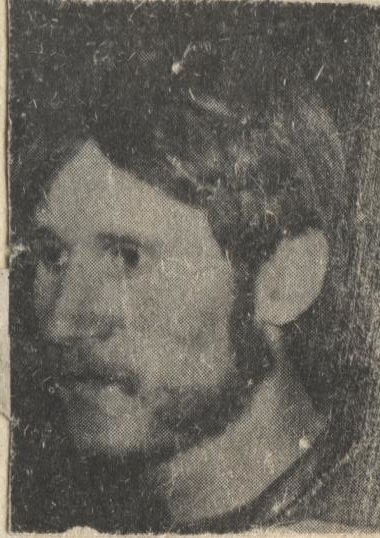 Geoff started his mechanical apprentiship in Bunbury at Flanagan Motors in Spencer Street in the mid sixties. Even at this early age Geoff had aspirations to build an engineering empire so he started his own business that he worked at night and on weekends while also serving his apprentiship, by the time Geoff was nineteen he had completed nearly four years of his apprentiship and had a flourishing business. 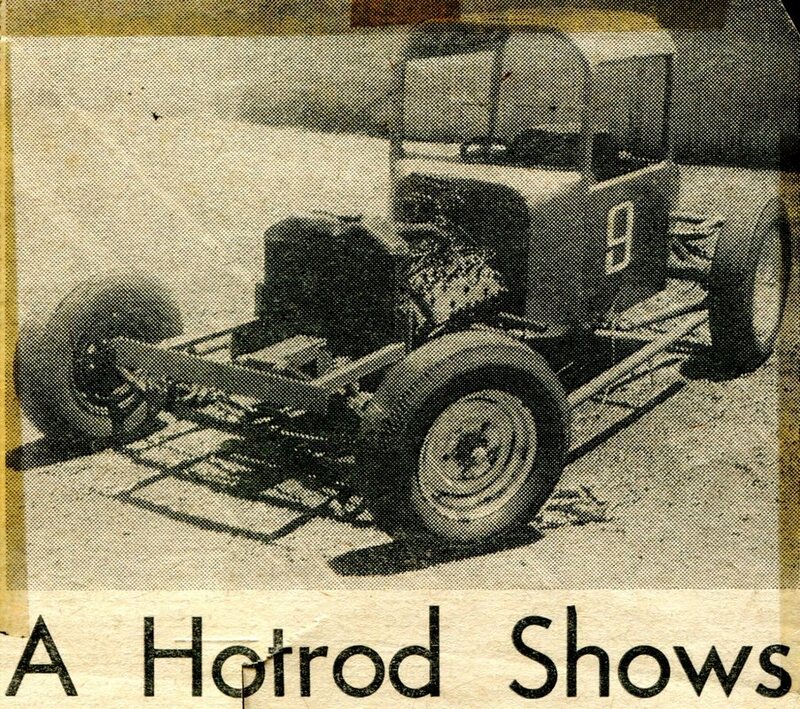 Geoff first built a modified hot rod to drag race, it was based on a stretched Super Modified with 2 Holden grey motors in line, running four carburettors with single wheels all round. Over time Geoff' was instrumental in starting the South West Drag Club, the club went on to organise drag meetings on the streets of Bunbury's which was a huge success. Judy began racing in 1965 at the age of 16 in a mark one Ford Zephyr, much to the disgust of her farther. she raced the car through to 1967 when Judy retired the car and her dad gladly cut the car up with an axe and took it to the tip. 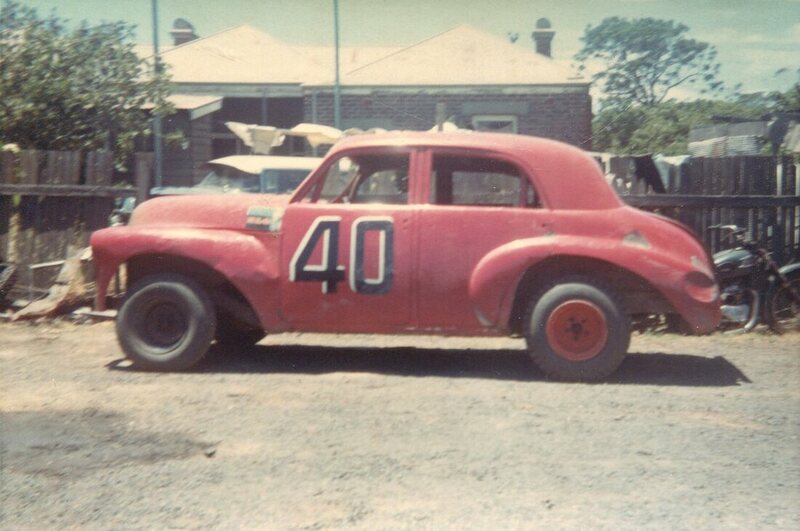 not ready to retire Judy then replaced the Zephyr with a Ford Customline V8 that she raced until 1969 when she married and gave Speedway away, today 2011 Judy has been envolved in the Bunbury City Council on council and also serving as deputy mayor. 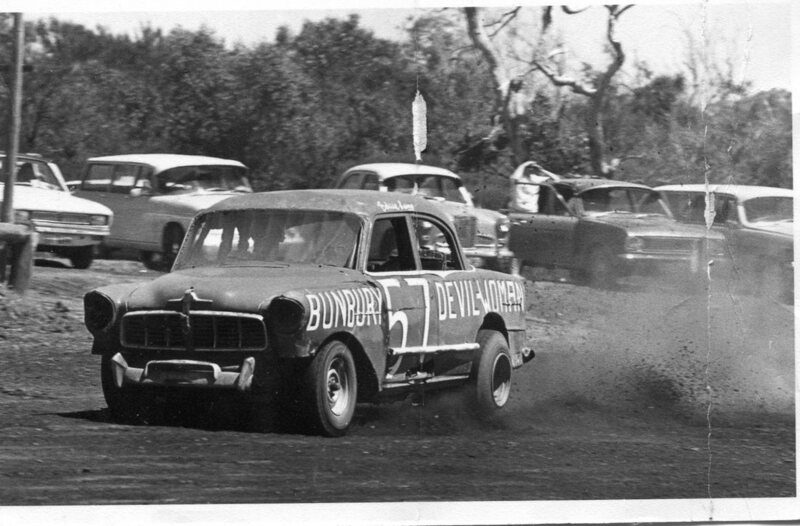 Judy Jones's Ford Customline that she stripped out to race at Bunbury's Blicks Raceway. 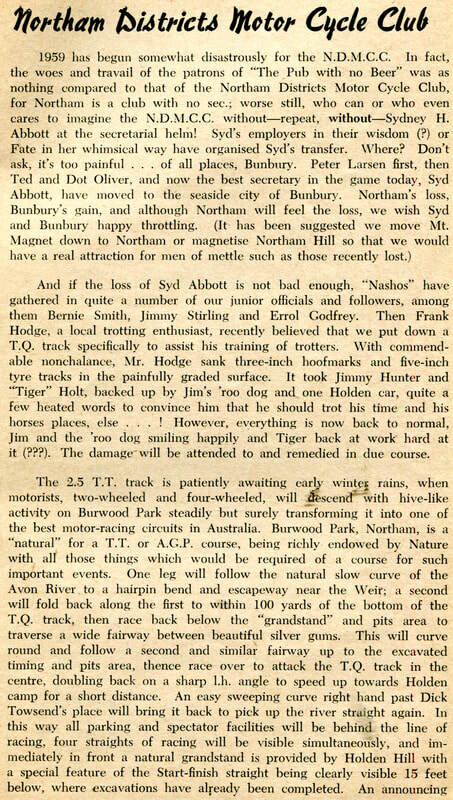 Eddie Gobby recalls: as a young fella I loved the hot rod racing at Blicks, so each Sunday along with my mates we would head out to Eaton for the day, now as we didn't have a lot of money and what we did have we spent on a packet of smokes, we could not afford to pay the gate admission, so we had to all swim across the river, at the same time keeping the smokes dry to get in, and also dodge Cliff Hillman who was patrolling the edge of the river and pushing us gate crashers back in the river. 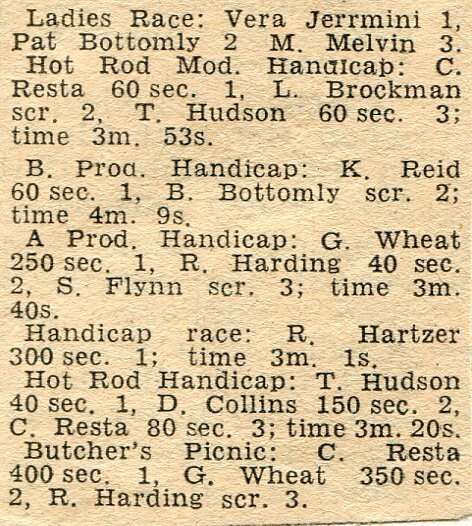 1970 - Nearest to tower Ray Willcox - Mick Bayliss - Rob Harding - Graeme Wheat all in Holdens. Photo: Brian Moyle. 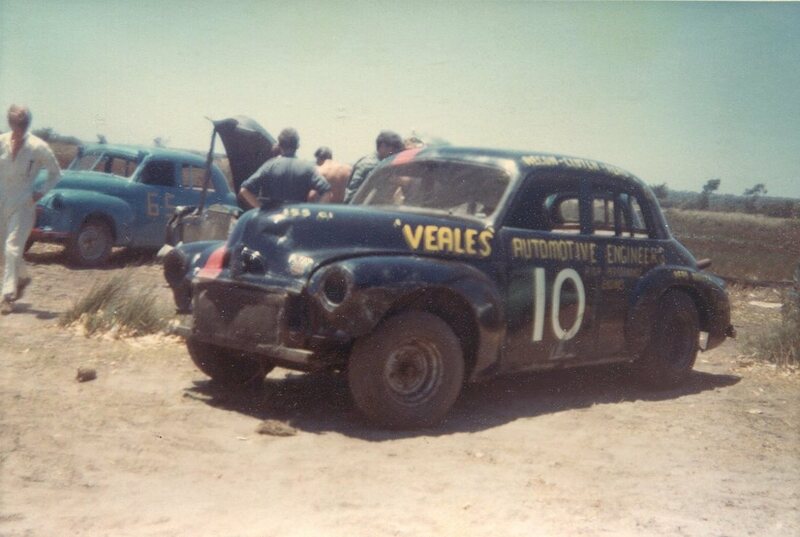 1970 - Darrel Thomson's very fast number 10 Holden 48 series in the pits at Blicks Raceway. Photo: Steve McCaul. 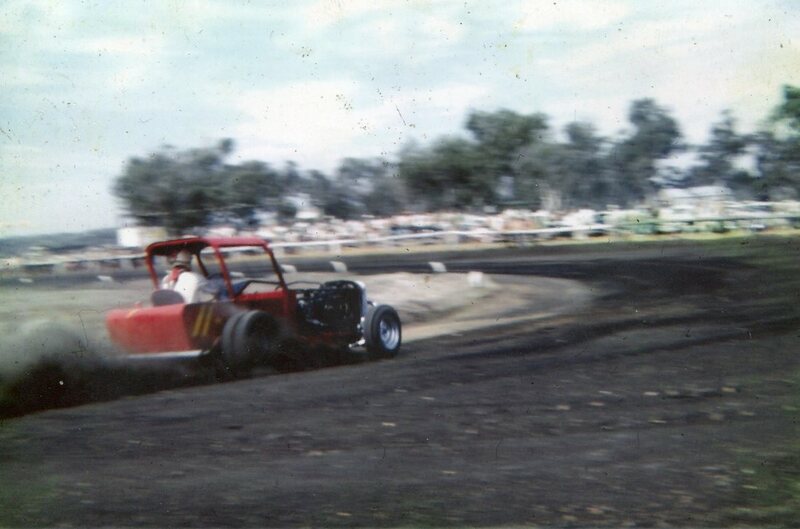 1970 - Mick Bayliss raced the 48 series known as Wild Child for Allan Woroll a service station owner in Bunbury and a racer himself who eventually moved in TQ racing, Allan was well known for his camshaft development. Photo: Steve McCaul. 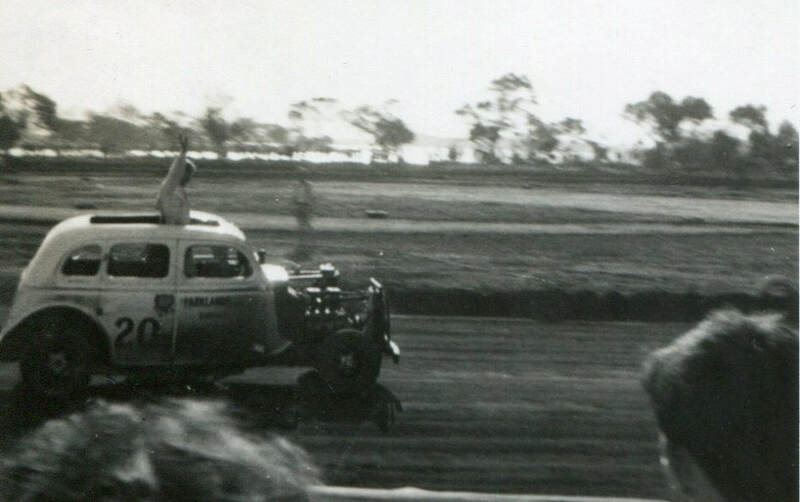 1971 - Vern Baker in his 48 series Holden making his way to the start line. Photo: Baker family. 1971 - Eddie Laing's Modified named Devil Woman in a street parade along Spencer street. Photo: Laing family. 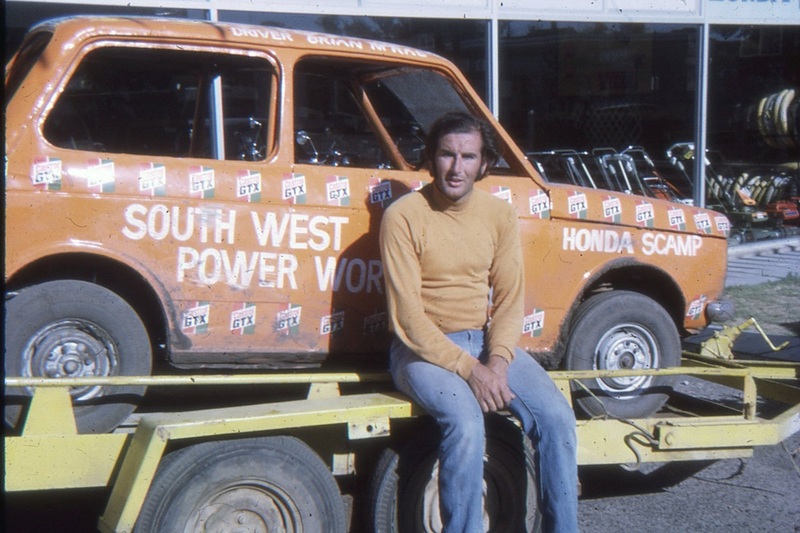 Brian Mcrae with the backing of South West Power World owner Ray Trebley came up with the idea of racing a 600cc Honda Scamp up against the more powerful Holdens and British cars of the day in what was Blicks raceway's final year. 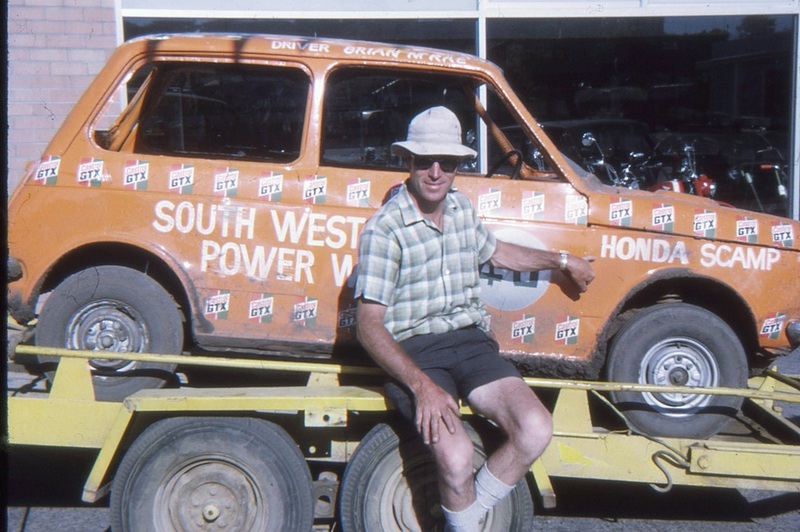 Ray being the Honda dealer in Bunbury at the time found a damaged car and Brian proceeded to build a speedway car, Brian went on to win many races that year including the Rothmans Championship held at Blicks. As the car was very light and unstable at speed Brian continuously found himshelf upside down at the hands of the bigger cars, he set a record that year winning an award for being upside down on ten occasions. 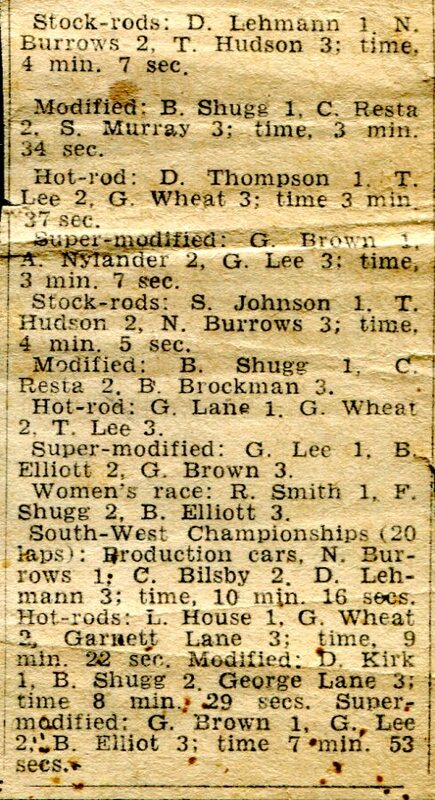 Blicks also ran a mechanics and ladies race on the day. 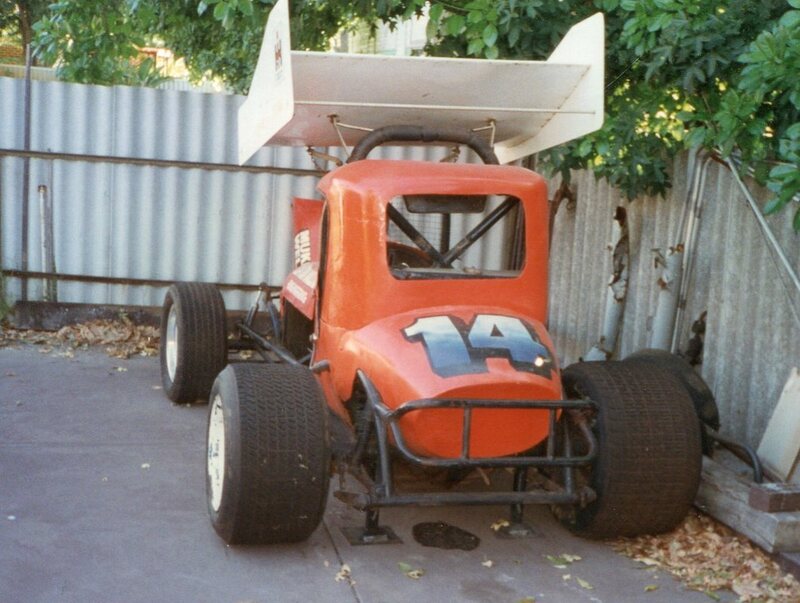 Brians younger sister Allison drove the car to many wins as did Phil Bruce in the mechanics race. 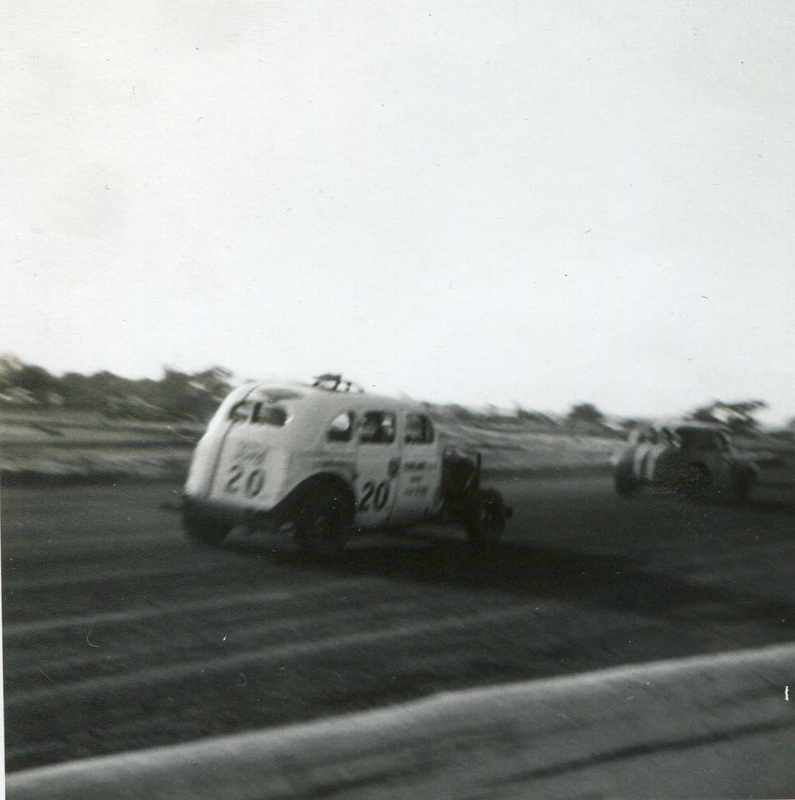 Brian McRae the first Japanese speedway car builder and racer in Australia, the small horsepower car won races againts dominant Holdens, Fords and British cars of the day. 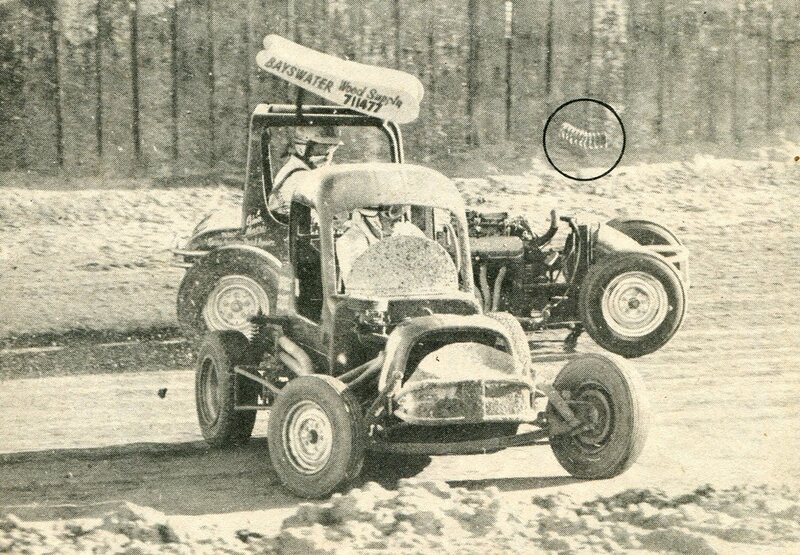 Ray Trebley the Honda dealer that had the vision and resources to find a damaged car so Brian could build a Speedway car out of a current car available to the buying public. 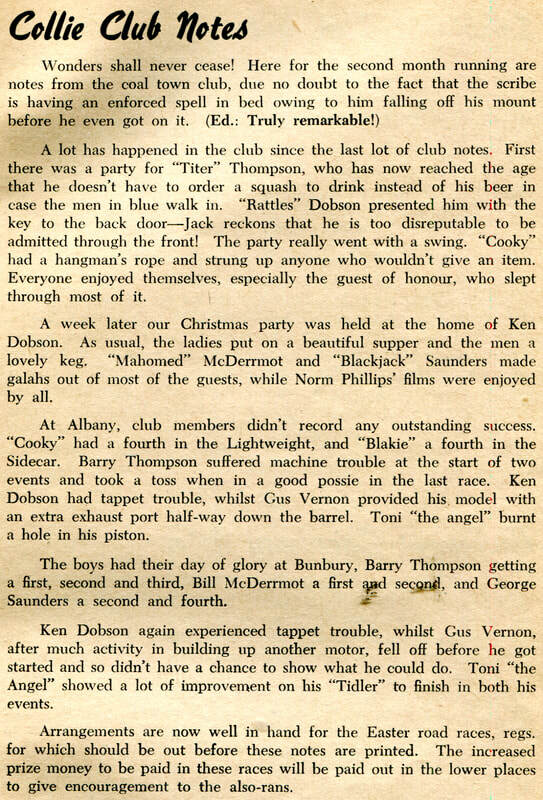 Harold Thomas recalls: I recall being at a club meeting in the Hudson family's celler when the matter of the Scamp was first raised. The request was to race a non complying car, as it didn't meet the minimum age of ten years old. 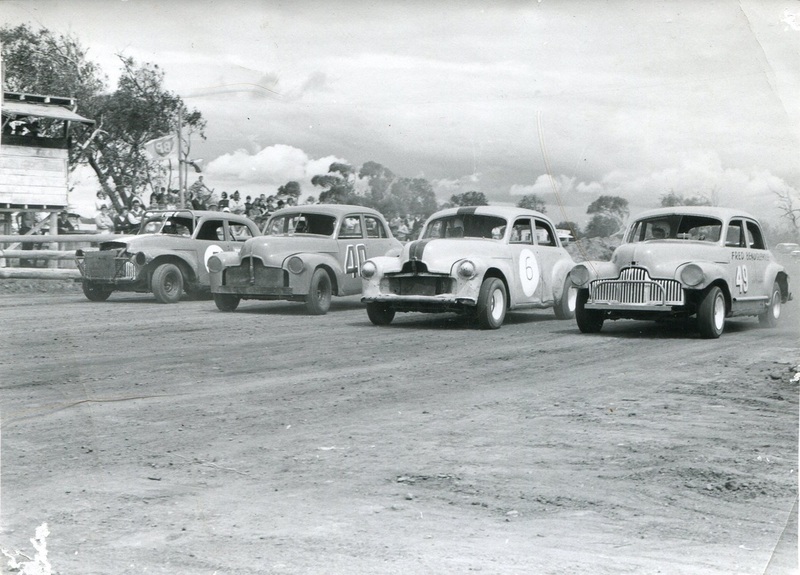 After discussion it was put to the stock division drivers, as that's where it was proposed to race the Scamp. The request was resoundinley agreed to, with the stockies consisting of grey Holdens, Vauxhals and a Zephyr or two. 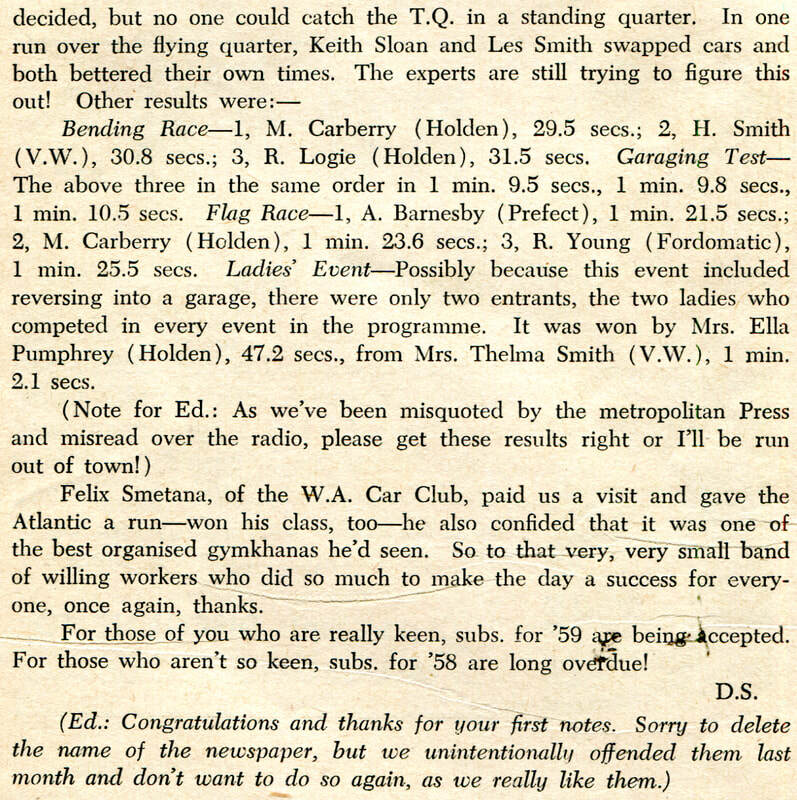 Problems were to arise with the South West Motor Sports Association, not that they could stop the Scamp racing at Bunbury as a novelty, also other South West clubs inviting Brian and the Scamp because it was such a drawcard. Day one for the Scamp Saw Brian McRae in great form, from memory winning all 5 heats with stock cars, the mechanics race against all comers and likewise taking out the butchers picnic. Stockie drivers were now ruing their vote of support !!! 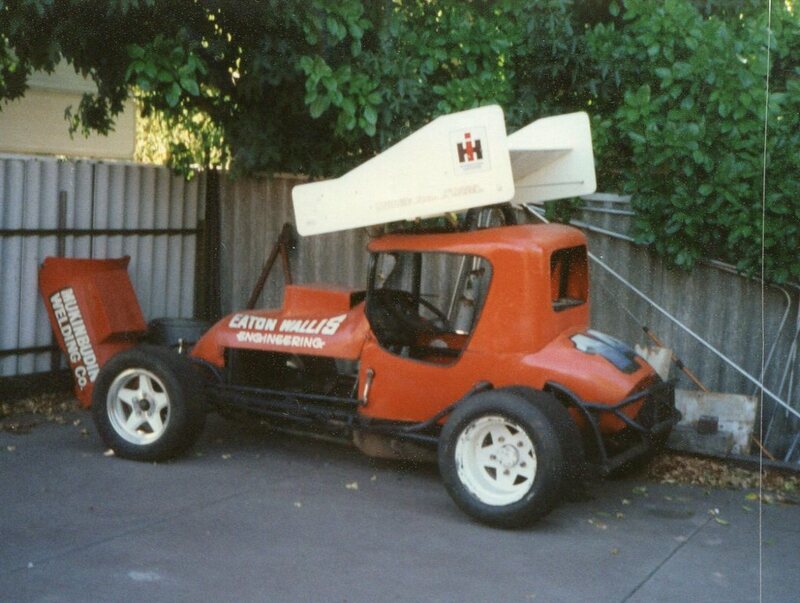 I was a Bunbury delegate to the South West Motorsport Association at the time and soon every monthly meeting was dominated by criticism of this little interloper, Bunbury Car Club was always in the bad books with the association, we regarded them a little like Cams is to road racing. the Scamp was such a drawcard it's little 600cc motor reving out with many gear changes per lap. 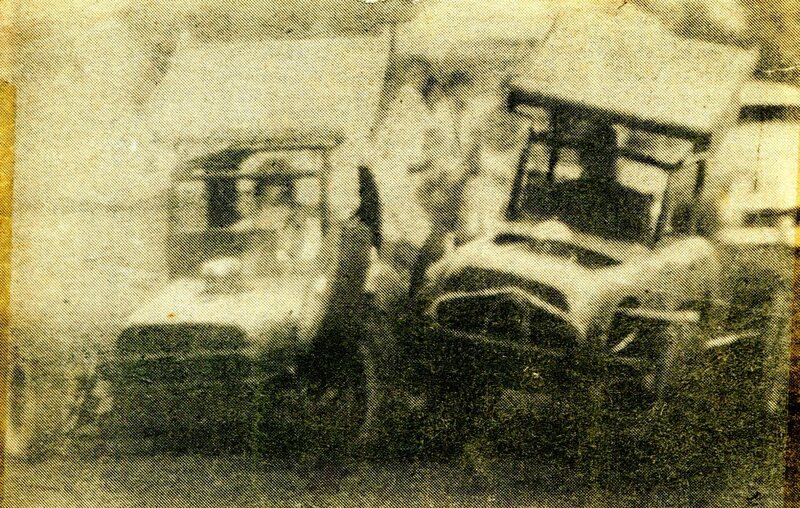 Rollovers were frequent and I recall an incident where a full rollover was prevented by the car leaning on a sand bank just forward of the start / finish line, Brian was able to give an allmighty shove on the embankment, Scamp bounced back on its wheels, the familiar sound of the Honda starter motor, then chased the field and completed the race. John also recalls the look on Garnetts face and the size of his eyes. 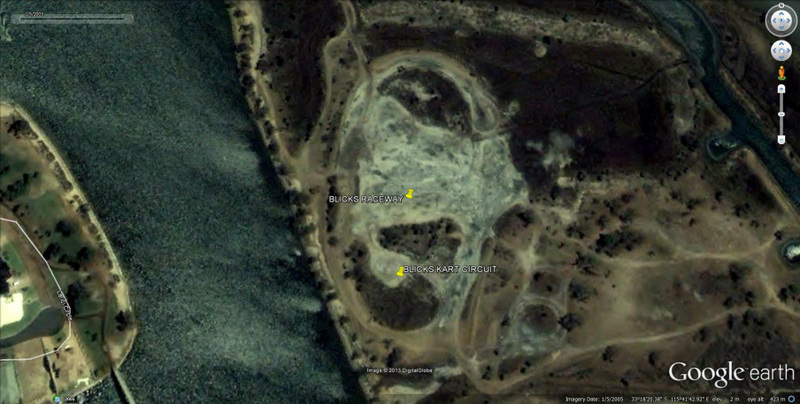 Very little remains of the original race track as the continual tide movements have washed and smoothed over the entire site, the race track area resembles a skid pan as many of the locals have cut up the area during high tide as a form of entertainment. Check out the 2009 and the 1969 photo of George Lane with the Jaguar powered supermod loaded up behind that very neat Customline, George with all the family was heading off home after another successful Sunday at Blicks, the Old Coast Road is visible in the backround.